Action: Discard X success tokens from 1 story to choose X cards in your discard pile and add them to your hand. Flavor Text: The bonds formed in Sigma Phi last a lifetime. When a brother called, you were bound by oaths to render aid. well, strictly speaking this card is not referring to my success tokens. So can I really remove an opponents success tokens for getting back cards from my discardpile? AlsoPatsy (Core) and Misinformation (SoA) can remove opponents tokens...or do I miss something? Ah, yes, now I've got the point. a story to put Descendant of Eibon into play from your hand or into your hand from your discard pile." so if this card can't discard opponent's token,it should read:"Discard X of your success tokens from 1 story"instead of " Discard X success tokens from 1 story". 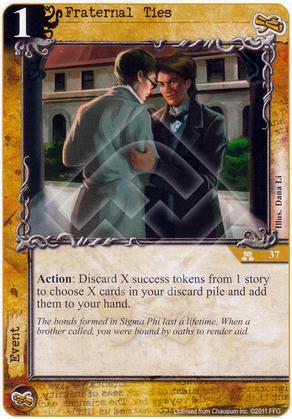 as it now reads" discard X success token",X should include both yours and your opponent's success tokens. Core rules and FAQ both says nothing about "Fraternal Ties",and so i believe my understanding is correct,at least for now. so we will need a judge from FFG to determine if this one can really do this.but before they gives a undoubt answer..just do it.. This is not a good card in my opinion. Success token are your priority, they win you the game. Sacrificing them for recursion seems to high of a cost. Giving up a won story would be too high a price to pay for almost anything, but there are times when tokens could be put to better use. Sometimes your success tokens are going to be discarded anyway, because you have no prospect of catching up when an opponent will win the story. At that point, playing this card to recoup one or two choice cards from your discard could be great, especially considering that Miskatonic doesn't really excel at accessing the discard pile. As miskatonic, I often find myself about to win 3 tokens on a story I already have 3 tokens on, which makes paying one token virtually free, and getting my best card from the discard pile is something I would often like to do (esp Ultima Thule). I also occasionally find myself about to lose a story I have several tokens on, putting those to use would be nice. 1) the fact you need to have success tokens for this work, which means if things are going badly for you in the game, this card can be a useless draw. 2) Stone Calendar - for a cost of 2 it gives me this card's effect in the repeatable form of a support card. Stone Calendar is superior, no question. Good point about token overkill with Miskatonic investigation power.